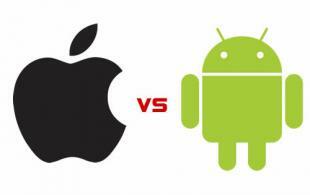 iOS vs. Android: Which development platform is right for you? Although very similar applications often populate both stores, depending on your application one platform may be better to develop for than the other. If you are trying to make money from purchases of or within your app, iOS is the way to go. Although Android has a higher market share of smartphones and has about the same number of applications, revenue of Apple App Store is more than twice than that of Google Play (the Android store). People on iOS tend to buy more apps and spend more on them. Of course, having smartphone users spend money on your app may not be your goal. There are plenty of free applications that get money through advertisements (Facebook) or serve as advertisements themselves (Walgreens). Download metrics show more applications are downloaded from Google Play, suggesting free apps may reach a larger audience on Android than iOS. Demographics are extremely important, especially if your app is an advertisement for your business or has advertisements in it. iOS users tend to be younger, richer, and more engaged, which corresponds with the iOS marketplace’s higher revenue. Their engagement is another critical factor to success–applications tend to be downloaded more in the Google Play, but are interacted with less. If you are looking to create an app that benefits from engagement, especially ones that involve social networking and in-app purchases, you may find more success in iOS than Android. The wealth of iOS users suggests that Android is better for targeting a less affluent audience. Additionally, Android’s worldwide smartphone share is much greater than Apple’s, so if your emphasis is on the international scale, develop on Android. Additionally, the iOS App Store is fragmented internationally, with different App Stores for different countries. Google Play’s store content is the same throughout, with some restrictions. Many but not all countries can buy paid apps from Google Play, and the list of countries where developers can publish from is even more limited. Besides these technical differences, there are also fundamental differences in the development process between the two platforms. Whereas for Android you can develop applications using a myriad of programs, iOS makes it so you must have a Mac, use their provided applications, and be a part of their developer program. While this allows for iOS developers to communicate on the same terms and use specialized programs for development, this sacrifices some freedom in choosing what to use in development. They also have stricter app review guidelines, which is accessible as part of their development program. Another major difference in development is the variety of devices that run on each platform. When working with iOS there are only a handful of devices to be concerned with, whereas Android has hundreds. Despite this, iOS development tends to cost more to produce, but app developers are more likely to break even. While a little messy, Android’s lack of a required first-party development tool means that you have the freedom to choose from lots of great development tools. Some, like the specialized MIT App Inventor, require no coding. Google Play has fewer app guidelines, and, unlike in iOS, there is the option to publish to other third-party app stores that can be run on Android. With so many options, it is a little harder to know where to start. OpenSesame offers a couple courses that help streamline the process, however. As you can probably tell, the Android vs iOS debate is not as simple as one being better than the other. Your app’s preferred market is inextricably linked to the goals and content of your app. Be careful not to place too much emphasis on these differences, however, as these marketplaces have more similarities than differences. Compelling content is compelling content anywhere–and boring content isn’t. Only once you’ve made a great concept should you be concerned about the intricacies of these markets.